Cellar on Greene has been a favorite spot for Monday or Thursday nights out ever since hearing about their fantastic $25 pizza and wine deal. Any Monday or Thursday, from 5-7 pm, choose two of their gourmet pizzas and a bottle of wine for $25. Let me recommend the “two pig”. Andouille sausage, pepper bratwurst, tomatoes, caramelized onions, tomato marinara, and manchego. Haven’t tried any of the others yet, its just that good. The Cellar also has a nightly 3-course dinner deal for $19. This is a great way to sample some fantastic creations by the chef who brought Columbia Mr. Friendly’s New Southern Cafe and Solstice Kitchen & Wine Bar, and this is what I’m really here to talk about. For our first course, my co-author and I started out with the City Roots salad and the Lobster Spring Roll. Delicious dishes, but unfortunately for you fine folks who eat with your eyes first, they weren’t very photogenic in the mood lighting. The City Roots salad was refreshing and had some great flavors working together with the blueberries, candied pecans, and balsamic-honey vinaigrette. Most of the ingredients came from City Roots, a small operation founded in 2009 and offers over 40 varieties of produce to local markets and restaurants in Columbia. The salad tasted just a little bit better knowing the ingredients were grown a few miles from the restaurant. Between bites of my salad, I stole a few tastes of the Lobster Spring Roll. Served over a bed of couscous and with a side of soy sauce, the Lobster set the appetizing standard for our entrees. 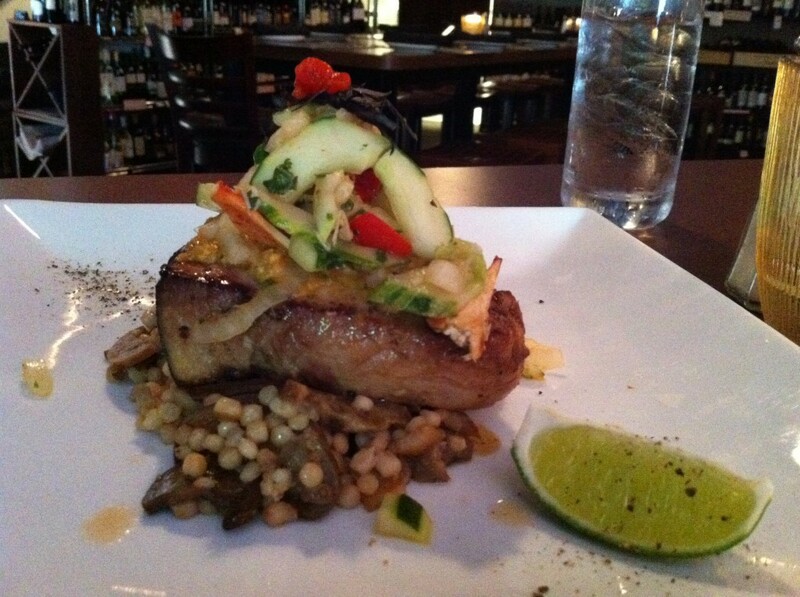 The Ginger-Soy Marinated Swordfish. My first foray into the culinary world of armed fish, and it was a deliciously flavorful experience. This perfectly seasoned swordfish steak is sitting on top of a bed of roasted eggplant couscous, sporting a very tasty topper: spiced peanut pesto and a cucumber-lobster “salad”. The wedge of lime allows you a brief moment of satisfaction as you contribute to the creation of this dish with a squeeze of limey acidity. Rivaling the Swordfish in taste and presentation, the Pale Ale Fried Red Trout. 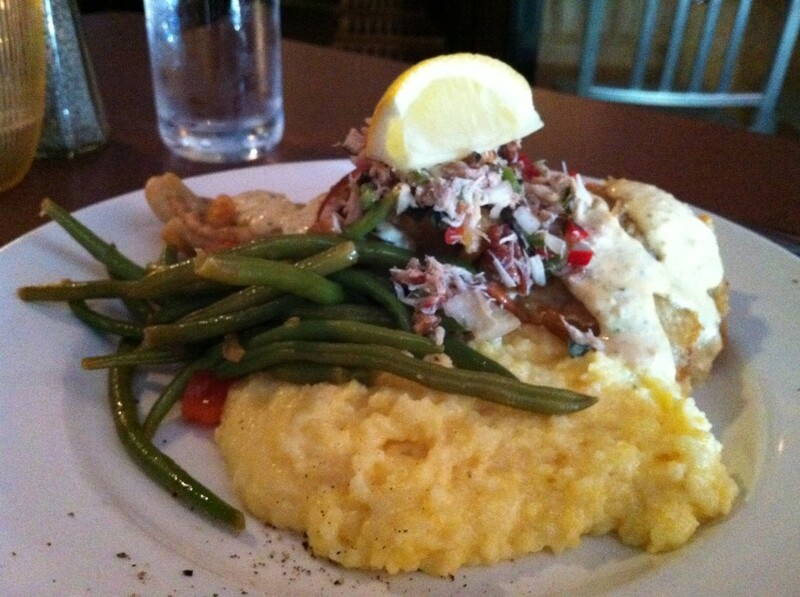 A southern staple, minus the flounder, but the trout makes a choice substitute. A fantastic crisp surrounds the trout, with a top layer of pecan-crab relish that finds its way into every delectable mouthful. The dish is served with a side of creamy palenta (fancy-shmancy for grits) and local tomato braised green beans. And finally, dessert! 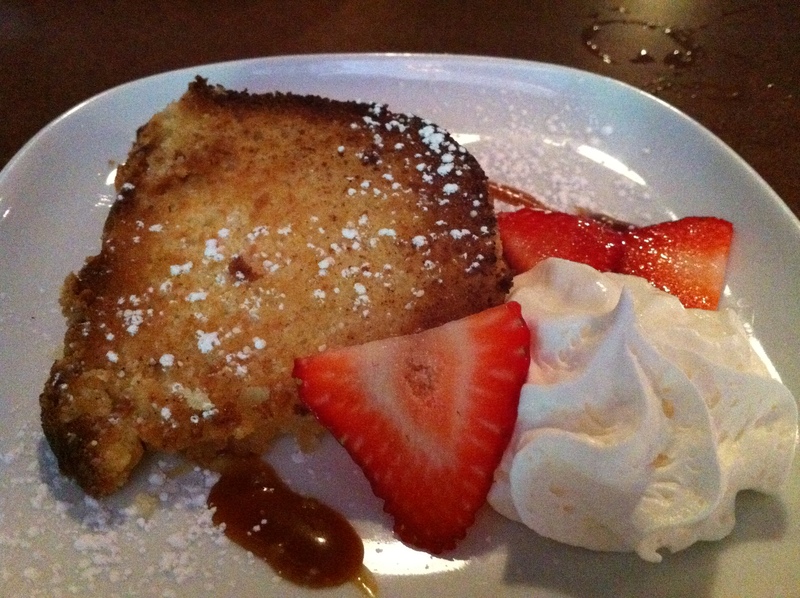 Seared Pound Cake served with caramel, strawberries, and whipped cream; and Mango Pie, featuring whipped cream, strawberries, buttered graham cracker crust, and a hint of mint. The Pound Cake was wonderful. 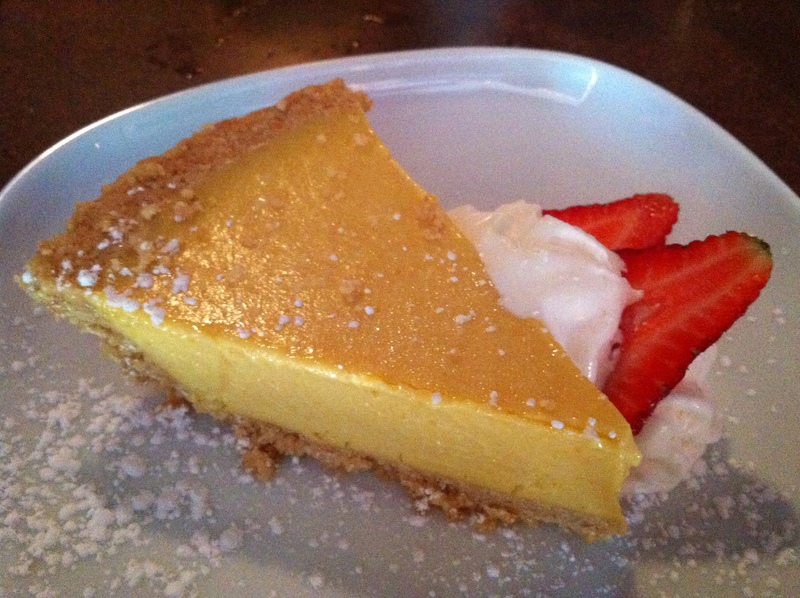 Warm and slightly crispy, but the real star of our post-dinner indulgence was the Mango Pie. Served cold and firm on a graham cracker crust, your taste-buds make an amiable introduction to the creamy texture and sweet freshness, and then the Mango aftertaste kicks in!Wish I could have bought the whole pie (will be looking into this). The Cellar on Greene offers some uniquely flavorful dishes, and a few weekly deals to allow you to enjoy the items on their menu more often. If you haven’t yet, be sure to give this relatively new establishment a chance to impress. The Cellar on Greene is located just off of Greene Street, right next to Mr. Friendly’s. Check out their website here and be sure to continue supporting local Columbia, SC restaurants with your patronage! Looking for a Fine Dining Columbia, SC Restaurant or Romantic Columbia, SC Restaurant? You found one.